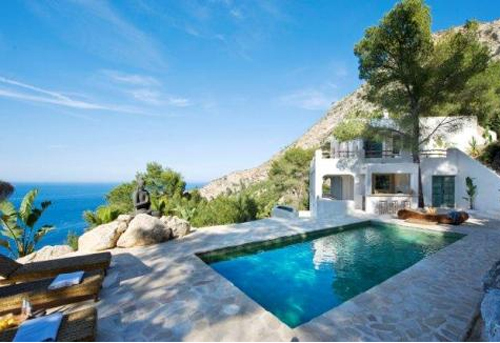 Do you have plans to move to Ibiza, Spain? 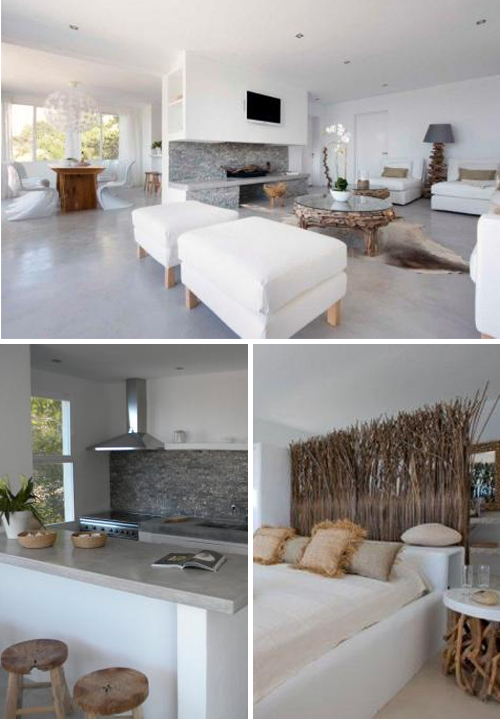 Then this renovated minimalistic finca might be the place for you! The beautiful finca with a Bali flavor is facing a 180º sea view with a hidden pebble beach down the mountain and total privacy on a 2000 m2 plot set within a natural protected bay where peace and nature are overwhelming. Outside there are many terraces on different levels with spectacular views especially on the roof terrace, but also around the pool (yes there is pool!). Are you ready to move in? I know I am but unfortunately this house comes with a price tag: 1,450,000 €. Perhaps I should start with that cool lamp in the top picture, which is from IKEA. Gorgeous place!… unfortunately I can afford just looking at these pictures 🙂 Anyway – thanks for sharing this house of dreams! I love to see a 1.45 million euro home sporting a lamp from Ikea. It makes me happy. This is my dream home! Gorgeous! I love the easy poured concrete floors. I would be happy with just the outside area alone. 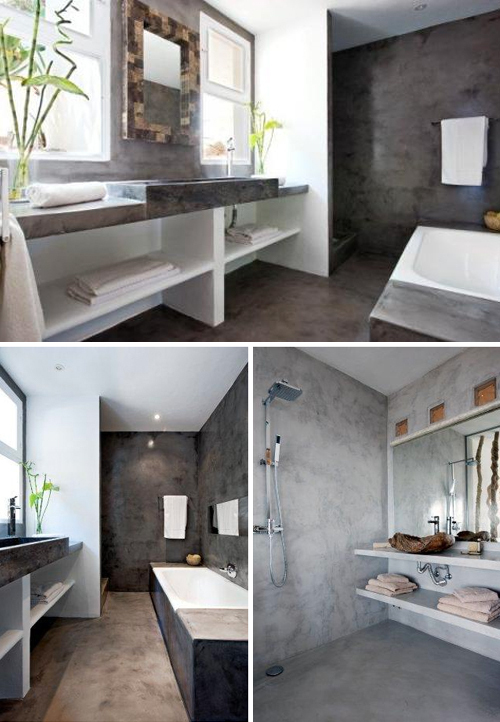 Amazing….I love this home. 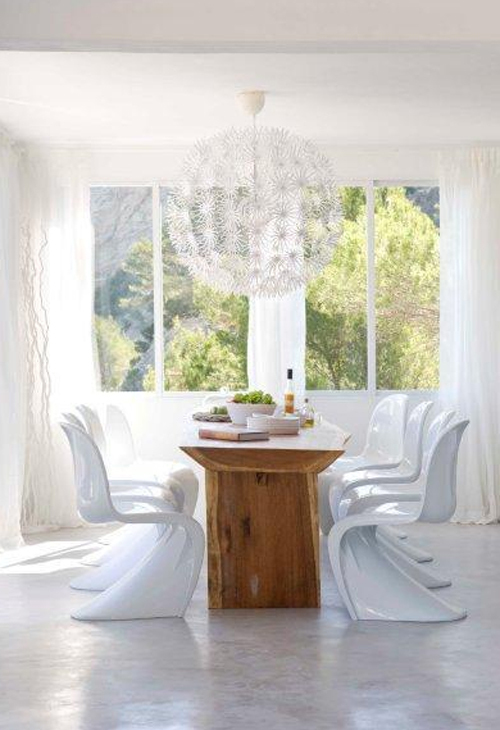 Beautiful views and I love the furniture in the dining room, the combination of the wood table with the sleek white chairs….just stunning!!! I am imagining myself sitting around the stunning slab table, perched on beautiful panton chairs, eating tapas and drinking Spanish wine with good friends! I wasn’t sold (I thought: pretty, but could be any modern house anywhere) until the pool photo. *HEART* That view is spectacular!